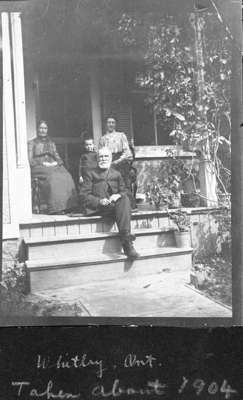 Black and white negative of a photograph of members of the Gordon family seated on the front porch of their residence. The residence of James Keith Gordon is located at 316 Colborne Street West on the north-east corner of King and Colborne Streets. James Keith Gordon was a lawyer in Whitby. The William Gordon family landed at Whitby Township in 1838.